(CNN) -- Thousands of people across the globe took to the streets on Saturday in annual demonstrations for May Day, the annual event marked by demonstrations demanding better working conditions. Known as International Workers' Day, the holiday draws thousands to peacefully protest. 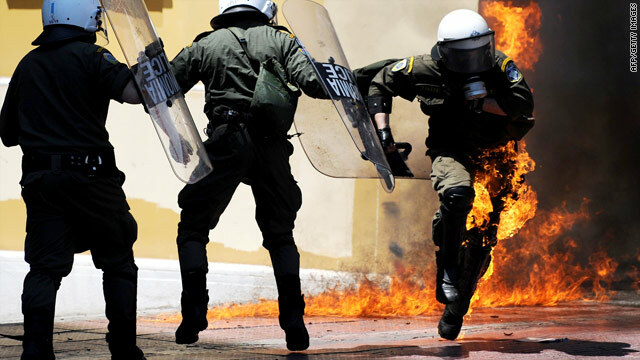 Others, as in Athens, Greece, clashed with police amid growing anger over the government's stiff plans to grapple with the country's debt. About 12,000 people in Athens were on the streets, waving red flags and at times surging toward a line of police, who wore helmets and carried riot shields. Those disturbances led to injuries and arrests. A satellite truck was torched and two ATMs, the glass frontage of a bank and a car were damaged. In Russia, more than 2.5 million people participated in traditional May Day celebrations in 900 cities and towns, the country's trade union federation said. The largest gatherings took place in Krasnodar, Yakutsk, Vladivostok, Izhevsk, Moscow and St. Petersburg. The people spoke out in favor of decent salaries and stable employment. Watch May Day demonstration in Paris, France. According to CNN sources and state-run news reports, there were many demonstrations. For this first time in 30 years, tens of thousands of union members and leftist political activists gathered for the first legally sanctioned May Day celebration in Istanbul's central Taksim Square. Several protesters were detained after clashes with police in Hamburg. Seventeen police officers were reportedly injured when confronting demonstrators who they said were throwing rocks and setting garbage cans on fire. A throng marched through Revolution Plaza in Havana. Crowds are usually big in Cuba on International Workers' Day but government officials said the turnout was a signal to Washington that the country is unified and supports its leaders. Several dozen cities braced for protests against Arizona's controversial new immigration law. Thousands gathered in several Asian cities for its annual May Day demonstrations. They demanded improved working conditions and wage increases. Clashes between police and protesters were seen on TV. Protests popped up at the Labor Ministry, where demonstrators clashed with police and shouted "Death to the dictator."